The Grand Canyon Trust's Native American Business Incubator Network invests in Native entrepreneurs, creating real change in Native communities. Craving sushi? Residents of Tuba City and its satellite communities on the Navajo and Hopi reservations once had to drive to a border town like Flagstaff to get their California-roll fix, but that was before chef Carlos Deal came to town. Recently featured in the Navajo-Hopi Observer, Deal’s one-man catering company, AlterNativEats, brings fresh, all-vegetarian rolls and Japanese-inspired stir-fries to the reservation’s largest community. Recently, Deal moved his business out of his home and into a new food-stand. He rents the portable food trailer and the right to park it across from the Denny’s restaurant near Tuba City’s main intersection, offering Tuba City’s residents a healthy alternative to the fast food options lining the main drag. Every morning, Deal posts his menu to Facebook. By lunchtime, hungry customers are lining up. “My customers are construction workers, pipefitters, people who’ve traveled all over the country and tried all kinds of food,” says Deal, who went to culinary school in Boulder, then cut his teeth in the kitchens of Denver for four years before returning home to Tuba City to launch AlterNativEats. “It’s kind of surprising, to see a big hefty construction guy come up to the truck and order a cucumber roll,” Deal laughs. Doctors and nurses flock to the truck from the nearby hospital and dialysis center, but Deal also serves meals to kids and to traditional Navajo elders. “All kinds of people like sushi,” he says. And at $8 a pop, Deal’s stir-fries don’t break the bank. With obesity, diabetes, and other food-related ailments challenging rural reservation communities, where access to fresh, natural foods is often limited, Deal’s cuisine goes back to the basics — vegetables, rice, seeds. Deal preps his maki and other rolls in advance, and cooks stir-fries to order. Flash sautéed on high heat with a simple four-ingredient sauce, they’re still steaming when his customers sit down to eat. His main challenge is getting orders out fast enough for his customers, while manning the register at the same time. Deal’s love for Japanese food is deep-seated. “Japanese cuisine dominates. Japan has more Michelin stars than Italy or other countries in Europe and they’re pioneers of healthy, simple, unaltered food, and of farm-to-table freshness,” Deal gushes. With the added mobility of the new food trailer, Deal can bring his clean, healthy eats to music festivals, fairs, and other events across the reservation. He hopes to eventually expand to his own brick-and-mortar location, and to ramp up deliveries. To achieve this goal, Deal sought out the help of the Native American Business Incubator Network (NABIN), a Grand Canyon Trust initiative that helps native entrepreneurs develop, brand, market, and grow their businesses. Deal is one of 10 entrepreneurs selected for mentorship and advising in 2018. After a bootcamp to learn the basics of accounting and finance, Deal has moved on to branding and marketing his business. 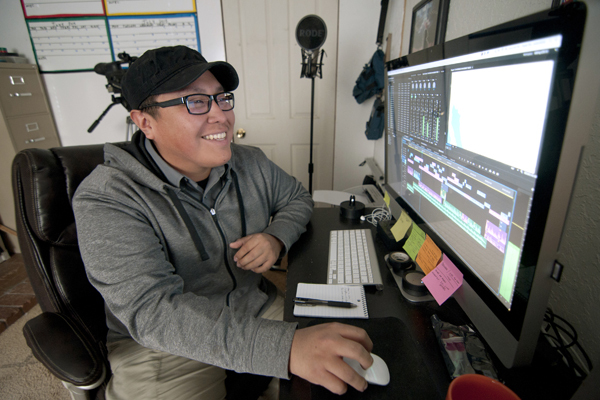 With the assistance of Corey Begay, the mural artist and graphic designer NABIN paired him up, Deal is working to develop a logo and launch a website. So if you’re headed up Highway 160 and in the mood for sushi, you’ve got a fresh, new, affordable option, and a chance to support a Native entrepreneur who is making his culinary dream a reality and bringing healthy, feel-good eats to a community that no longer has to drive into border towns to get a taste of Japan.